Chinese exports have seen their sharpest drop in almost seven years, adding to concerns over the health of the world's second largest economy. Exports dropped sharply by 25.4% from a year earlier, while imports fell 13.8%. The weak data comes on the heels of Beijing registering the slowest economic growth in 25 years. 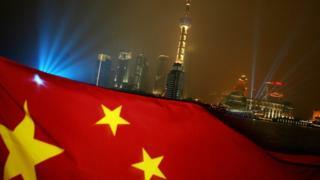 China's National People's Congress, currently underway in the capital, has just revised the 2016 growth target down, predicting a "battle for growth". The February trade figures are likely to raise new fears over China struggling to maintain economic growth while implementing reforms and trying to shift towards more services and domestic spending. Customs figures showed exports fell to $126.1bn (£88.5bn) last month. That was down 25.4% from a year earlier and worse than an expected fall of about 15%. The poor trade data marks the worst performance since the height of the global financial crisis in May 2009. However, analysts cautioned that the data might have been affected by the longer-than-usual Chinese Lunar New Year holidays. With China often referred to as "the engine of global growth", the weaker global demand for its goods is read as an indicator of the general global economic climate. China has often been called the factory of the world, but that narrative may now be changing. As global demand slows down, China is selling less to the world, but it is also buying less from the world. True - Tuesday's trade figures may have been affected by a longer than usual Chinese New Year period last month, which meant workers were on holiday and factory owners may have brought orders forward or delayed them. But these February numbers will continue to put pressure on China's leaders as they grapple with the worst growth rates in 25 years on the mainland.